The hotel is about an hour’s drive from the airport. From our experience, this side of the island has better weather and calmer seas. Upon arrival, we were announced with the banging of a large gong and offered cold towels and a nice green cocktail. As a Hilton Gold member, we were upgraded to a junior suite with a sea view. The room was spotless, comfortable and really close to the sea. Some complimentary chocolates and fruit were delivered a few minutes later. All the staff; reception, restaurant, cleaners, were especially friendly and helpful. They have this nice ‘one hand on heart’ type greeting when you meet – I’m not sure if this is a Mauritius tradition or particular to the hotel. Wi-fi was good quality and I could still get a good signal on the beach. Hilton Gold members receive free wi-fi, but I think all hotels should offer this to all guests for free – the wi-fi here seems expensive and would have cost me over £100 for the week had it not been free. 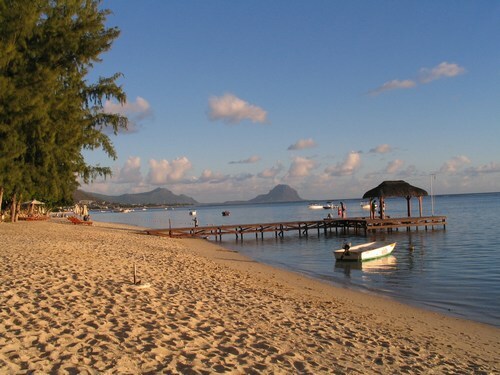 The beach is sandy, has plenty of sun loungers and only a few hawkers who only ask once before moving on (much better than the Caribbean) – all beaches in Mauritius are public. There were no sand flies or mosquitoes; the hotel says that they fumigate the entire area almost daily using a process called ‘fogging’ and although I didn’t see this happen, the result is apparent. We saw some wasps attempting to nest on our room terrace and asked for ‘fogging’ there. Again, we didn’t see it happen, but they were gone after that. The lagoon is very calm as it is protected by a coral reef a few hundred metres out. The water was cold (July is their winter) and there were very few fish to watch when snorkelling. Those who have visited the Maldives, we went May last year, will know that it is like swimming in a warm tropical fish tank teeming with life. So we were a little disappointed. Pedaloes and kayaks are available free for guest use as is a glass bottom boat trip. However, the glass bottom boat seems to stay in the lagoon and so there’s nothing to see through the glass. Paid trips beyond the lagoon are offered and I suspect that restricting the free trip to the lagoon helps with the sale of these. Entertainment is provided nightly and this ranges from a piano player and singer in the upstairs bar to a full dance act by the beach bar. All was done quite well and not cheap or cheesy. There is also a torch-lighting ceremony at 7pm each night (it gets dark early in Mauritius), where they light the torches that line the paths. I filmed this and put it on YouTube (missed the very end when I ran out of memory). We were on a full-board plus package; buffet breakfast, al la carte lunch, buffet dinner. Two glasses of wine or beer per person, plus water are included with lunch and dinner. Complimentary bottles of water were left in our room each day. The hotel has a central tips box in reception and discourages individual tipping. That certainly makes life easier and I just hope that guests put the equivalent of a week’s worth of tips into the box before they leave. A Pina Colada or a glass of Rum, strangely cost about the same from the beach bar – £8 – so may as well have a cocktail! I’d strongly recommend full-board plus, as you could spend a lot of money here on both food and drinks. However, I couldn’t see this as an option on the Hilton website and had to book via a tour agent that offered the fbs package. The breakfast buffet was excellent – more like a brunch than just breakfast. Coffee, tea and orange juice are served at your table. There is also a juice bar where they will ‘fresh juice’ a selection of fruit. I noticed, too late, a bottle of sparkling wine – not sure if that was included or not. The breakfast restaurant is the main restaurant where they also have the dinner buffet. There is a high roof that covers all but the outlying tables, but you are effectively outside. That means that birds, cats and insects have easy access to you and your table. The cats seemed almost domesticated and didn’t cause any problems – I think most people actually enjoyed them being around. The birds were well behaved enough so that you didn’t have to cover your plates when leaving the table – they mostly just scavenged the floors and abandoned tables. The flies were the most annoying, with some days being worse than others. If I were the hotel, I would surround all, or part, of the restaurant with a large insect screen – just like they have around the swimming pools of Florida villas. It would still be possible to see outside, feel the breeze etc, but also eat without interference. I would also be happier if the buffet was within such a protected area, as you can’t know what landed on the food you are about to take. Lunch was on the beach, although using proper tables and chairs – many under small huts. The al la carte menu had enough variety and quality to last the nine days we were there. There is also a ‘fish of the day’ and that was always good. Again, there are birds and insects, although no cats! Apart from the flies, there were some giant wasp things that looked like their sting would fell an elephant (see picture below). Luckily these wasps weren’t aggressive and evil like European wasps and didn’t bother us. I’m sure, for most people, the idea of having lunch and a glass of wine while sitting on a beach in Mauritius sounds idyllic, but I became weary of the flies and wished that there was somewhere indoors (or screened) to eat. The Dinner buffet was spectacular, with a different theme each night. There were no flies in the evening. The food all seemed to be of good quality and presentation. In fact, we became so confident in the food that we found ourselves assembling a mezze of the various dinner offerings around our plates. I almost didn’t include the next few lines as I don’t want anyone to be discouraged from staying at the hotel or be nervous about the food, but equally I guess Europeans need to be aware that they can’t dine with impunity. After eating breakfast, lunch and dinner for over a week without any problems, I awoke at 3am with stomach pains. It was clear from what happened in the bathroom for the next several hours that I had food poisoning. My girlfriend was fine. An autopsy of our shared and non-shared dining choices, from the night before, cast suspicion on the prawn and chicken curry. I should also say that I’ve eaten in Egypt, Maldives, Thailand, Korea and Hong Kong without any problems and so if something made me sick then it was definitely pretty bad. I hardly ate the next day and was still a bit fragile the day after, which also happened to be our last night. So it was especially ironic to find that the restaurant had prepared a special table-service degustation menu for us. Plate after plate of delicious food arrived, from which I took just a small bite from each. I hope that if this happens on your last night, you can enjoy it more than I was able. We were provided with a particularly generous late check out the next day and left with mostly good memories of our stay.